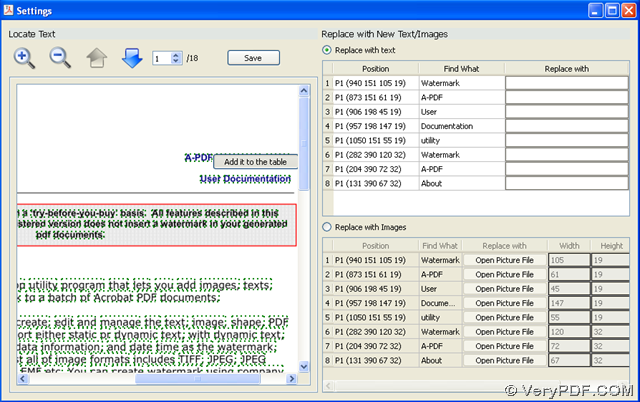 This article is about how to remove PDF watermarks with VeryPDF Text Replacer on Windows platforms, which could make it easier and quicker to remove PDF watermarks in batches through simple-to-operate GUI interface. What is VeryPDF Text Replacer? VeryPDF Text Replacer is a combination of GUI and command line, so Windows users could be of 2 options due to hobbies to remove PDF watermarks through GUI or command line. You can find more information of VeryPDF Text Replacer at here. And if you want to experience VeryPDF Text Replacer here, please click at here. How to use VeryPDF Text Replacer to remove PDF watermarks in batches? 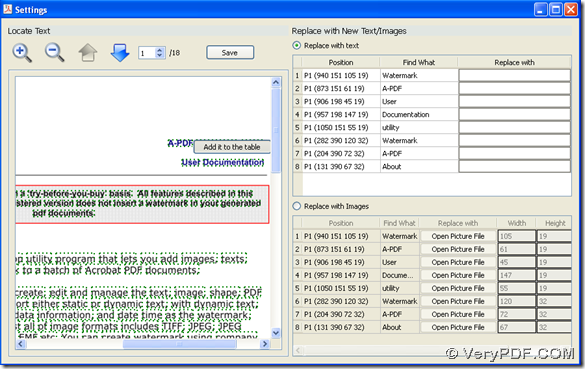 Click > select PDF files > click Open, then PDF files can be added successfully as displayed in the following pictures of GUI interface of VeryPDF Text Replacer. Then, you need to choose radio Replace with text mode in order to remove PDF watermarks by the way of being replaced with nothing in text mode: click one of watermarks you want to remove later > click Add it to the table, in table of Replace with text, content, position of watermarks could be displayed in related rows and columns, and for us, in edit boxes Replace with, there is nothing for you to type there, just leave them alone – empty there so that later when you start to remove PDF watermarks from PDF files, it will work. Then, please click Save in order to save your settings on setting panel. At the end of this article, which is about how to remove PDF watermarks in batches with VeryPDF Text Replacer, please do not hesitate to contact our support team here. For command line processes to remove PDF watermarks in batches with VeryPDF Text Replacer, please keep your eyes on VeryPDF Knowledge Base, or go to command line user guide of VeryPDF Text Replacer. This entry was posted in PDF Text Replacer and tagged command line, in batches. Bookmark the permalink.